I've just uploaded a new version of the ListenAgain widget. This version adds the much needed, and much requested, ability to skip forward and back through playing programmes. Rather than fast forward the skip jumps ahead in convenient increments. Funnily enough the thing that took the longest time was drawing the new image for the control buttons. 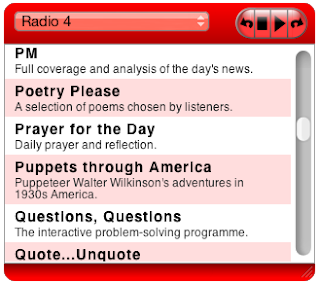 Troubleshooting: If you cannot play radio streams, and also cannot play streams directly from the BBC web site in Safari then RealPlayer is probbaly not installed or configured properly. Lovely widget. Thank you very much. Also filched the buttons and had a look at gimp for the first time so thanks for that too. Looking forward to renewing my aquaintance with SF after 36 years in the autumn. It would be even greater if you could choose to listen to any of the previous 7 day broadcasts like you can on the BBC web site.